It's very rare that I fall in love with a jewellery brand and feature it here on the blog but how could I not? When I was accepted to receive and review a few Buckley London jewellery pieces from The Bloggers Hub I was extremely excited. 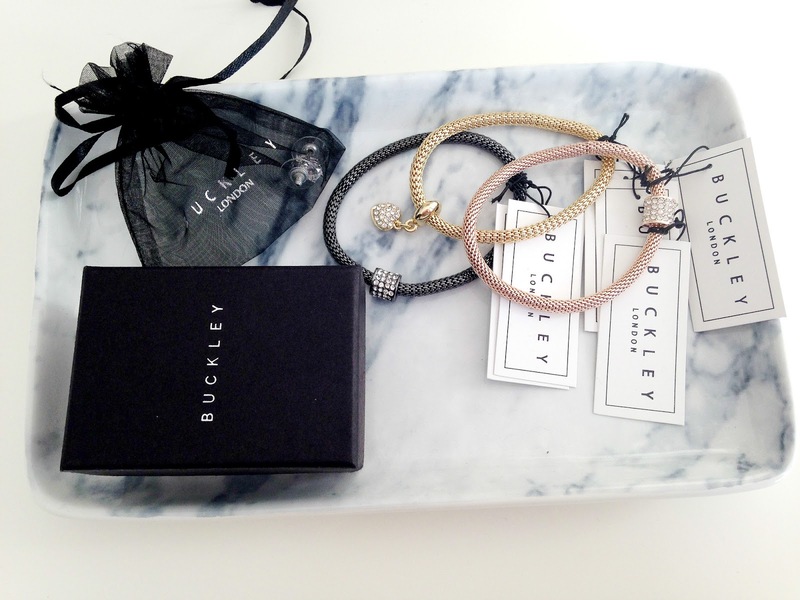 First off Buckley London isn't a brand that I had heard of beforehand but they have a range of many stunning jewellery pieces such as bracelets, necklaces and rings all featured on their website. It's almost overwhelming as everything looks extremely pretty but they are very much affordable and not overpriced in the slightest. I received three products from Buckley London, the Sparkle Mesh Bracelets, Sparkle Poppy Brooch and a pair of Princess Cut One Carat Stud Earrings. My favourite of the three are undoubtedly the Sparkle Mesh Bracelets. They came in a set of three. I received a gold, black and rose gold bracelet but they were all individually packaged rather than as a set. Typically my favourite is the rose gold as I am slightly obsessed with rose gold lately. The Sparkle Mesh Bracelets are ever so lightweight and delicate on the wrist, not heavy in the slightest which is a good thing. I can't stand the feeling of heavy jewellery. They also feel a little stretchy but not entirely. I have quite small wrists anyway so they fit perfectly which I love. You could wear one or all of the bracelets stacked on the wrists with the most simplistic outfit combination and they will really catch the eye, particularly because of the encrusted crystal detail on the bracelets. The Sparkle Mesh Bracelets are £24.99 which came as a shock(but a good shock) to me as they look a little more expensive than that. Unfortunately the Princess Cut One Carat Stud Earrings were a bit hit and miss with me. Don't get me wrong they are absolutely beautiful but they felt a little heavy at first for stud earrings but that could possibly be because I hadn't worn earrings for well over a year and so my ears had been closing up. They came packaged inside a small black drawstring bag with the words Buckley London on the front which I prefer to a box as I don't see why you should waste a box for such small pieces of jewellery. The earrings are square in shape and they look incredibly classy and so stunning. Perfect for a special occasion such as a wedding and they will make a lovely birthday gift. The Princess Cut One Carat Stud Earrings are £25.00 which is rather reasonable. Last but not least is the very special Sparkle Poppy Brooch. The Poppy Brooch is encrusted with over 100 ruby crystals with a gold 'border' around it and there is also a beautiful engraving on the back with 'Lest We Forget' which is such a lovely touch. I'm not one to wear a brooch but it is for a very good cause to support The Royal British Legion which gives a minimum of £8.33 from selling one of these to them. Isn't that fantastic? I will for sure be wearing this Poppy Brooch in honour of the incredibly brave and amazing men and women that have fought and are fighting for our country on Rememberance Day this November. You can purchase the Sparkle Poppy Brooch for £25 but please bare in mind that nearly half of the proceeds go towards TRBL. Overall I am so amazed and impressed by every product I received. It's a shame that I didn't get on so well worth the earrings but I have such a long wish list now, starting with the Lily Necklace in Rose Gold and a whole lot of other beautiful jewellery. Have you tried anything from Buckley London? What are your favourites? So the other day I went through my skincare regime that I tend to stick to on my pamper nights but let's not forget the body and hair. They're just as important and need as much love and attention as the face does. I have so many haircare and bodycare products but I've whittled it down to the main favourites that I use and love more than others. A pamper night just doesn't feel right without a bubble bath which is where Lush comes in. I have fallen for two of the Lush bubble bars. The Creamy Candy Bubble Bar(it smells like snow fairy, need I say more?) and The Comforter. They both smell incredible and leave me feeling completely relaxed. Not only do I get bubbles out of the Candy Bubble Bar but it makes my legs feel silky smooth. As for the body, I am completely and utterly in love with the Fruits Rhubarb and Vanilla Fragrance Explosion Body Scrub and Shower Gel. They are incredibly sweet scents and rather strong too as you can probably guess. It's not necessarily a scent I'd normally go for as I tend to stick to the fruity or floral scents but I adore the smell of these. I tend to use the scrub before I shave my legs for ease of shaving to rid my skin of any dryness and I use the shower gel followed after to make the scent linger on my skin for longer. There will be a review to come on these in the near future. Moving onto the hair, I have found the perfect shampoo and conditioner duo. For the last two years it had all been about Aussie haircare for me but I kinda got bored of using the same brand and so I have been trialling a few brands lately. I've come across the Lee Stafford Hair Growth Shampoo and Conditioner and I quite like them. I mainly picked them up due to the 'hair growth' statement/claim they made but they were also on offer too. The range has quite surprised me and there will most definitely be a review followed soon. 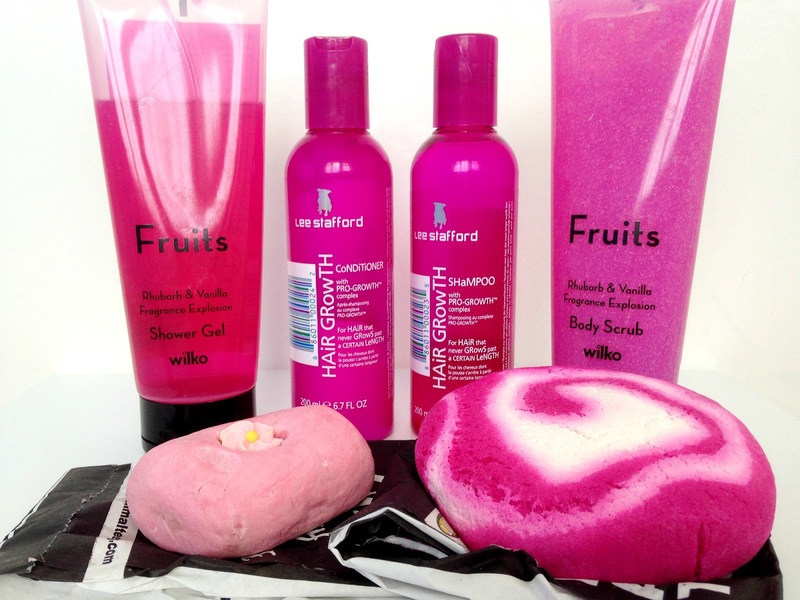 What are your Bodycare and Haircare essentials for a pamper night? One product that is never missing from a skincare routine or a pamper night is a face mask. As I suffer from acne prone skin it is an absolute must for me to help rid my skin of any grime and makeup that's living underneath the surface to prevent more spots appearing. When I was contacted by May Beauty about a very interesting face mask, named The Incredible Face Mask(a big statement there, is it not?) I felt that I had to give it a go and see if it lived up to its 'incredible' name. First things first. I had never heard of May Beauty before so it was great to try something different from a new brand. I received a set of five sachets of the face mask, a brush and a very informative 'mini book' called The Incredible Skin Guide. Inside it has a lot of information about what to expect, how the mask works and even information on what food to stick to, to help clear the skin and there are also comparisons between diet and medication. The scent of the face mask is pretty incredible. It's very rare that a face mask smells this good. 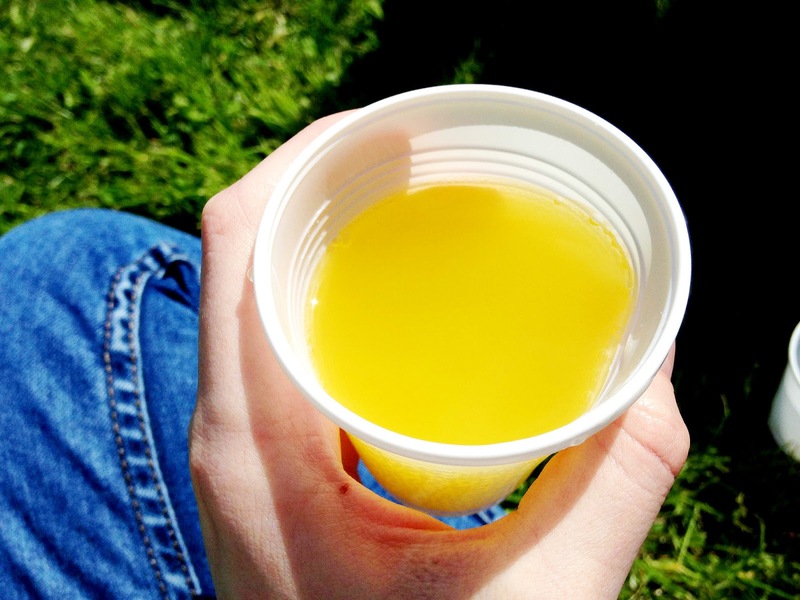 It has a fruity hint to it which is so appealing. The Incredible Face Mask is a peel off face mask which is unlike something I've tried before which was a nice change from the norm. I've normally gone for the 'apply and wash off' kinda face masks. I applied May Beauty Incredible Face Mask after a quick double cleanse. I found that one sachet is more than enough for the whole of my face but I didn't find the brush very handy in applying it so I just used my fingers. I left it on for the recommended time(around 45 minutes) and I can't say it wasn't painless when peeling off which was a major put off for me. I have a very high pain threshold normally which shocked me because as I was peeling it off I winced in pain. I had to peel it off really gently. It took a good 5 minutes until it was fully removed and it actually resembled a bin bag afterwards. I don't know how else to describe it, sorry. I can't deny the benefits of the face mask in the aftermath though. Once the excess of the face mask was removed my skin felt reasonably smooth and my sister actually said she had seen a difference in my skin which is a sure good sign. Unfortunately I couldn't get over the pain of the peeling process that I really wouldn't purchase as much as it had benefited my skin. 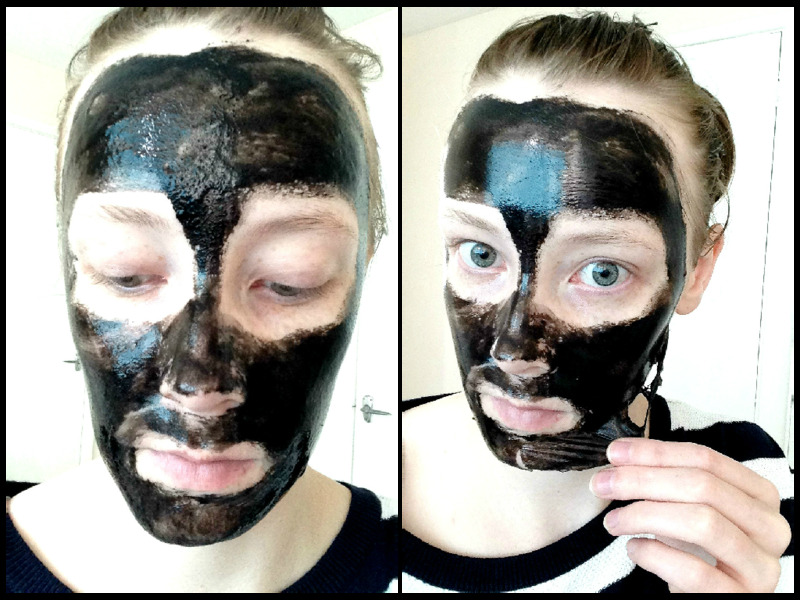 Have you or will you be trying out the Incredible Face Mask? I am all about my pamper nights lately and so I thought I would share my pamper night essentials with you. I have not long gone back to work after nearly six months maternity leave so I've really started to cherish my relaxing pamper nights. I always try to at least pamper myself once or twice a week at most. And when I pamper myself, I go a little crazy, especially with the skincare. There is nothing better than removing my makeup and revealing fresh, clean skin after a long day. I am a double cleanse kinda girl. I use the Garnier Micellar Cleansing Water that's specifically made for my skin type to remove my makeup with a cotton pad or two(or three). Oh the relief when it's all off! It's like whipping your bra off after you get home from work or a long trip out. Anyone agree? I then go in with my latest second cleanser of choice which is the REN Clearcalm3 Clarifying Clay Cleanser to remove any excess dirt or makeup left on my skin after the first cleanse. I tend to get a bit of dry skin on my face lately which isn't the best base for foundation so an exfoliator is always a must for me. I adore The Bodyshop Seaweed Pore-Cleansing Facial Exfoliator for this and it works a treat. And of course a pamper night is not a proper pamper night without a face mask. My favourite is the Origins Clear Improvement Mask. It is quite incredible and I can always rely on it to help make me and my skin feel good, especially when my skins at its worst and acting up. 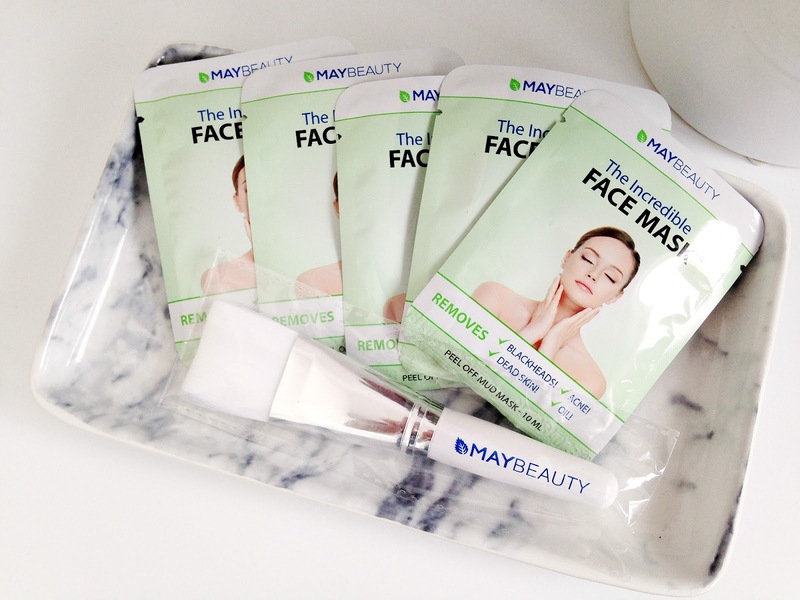 For more info on this good ol' face mask take a peek here. 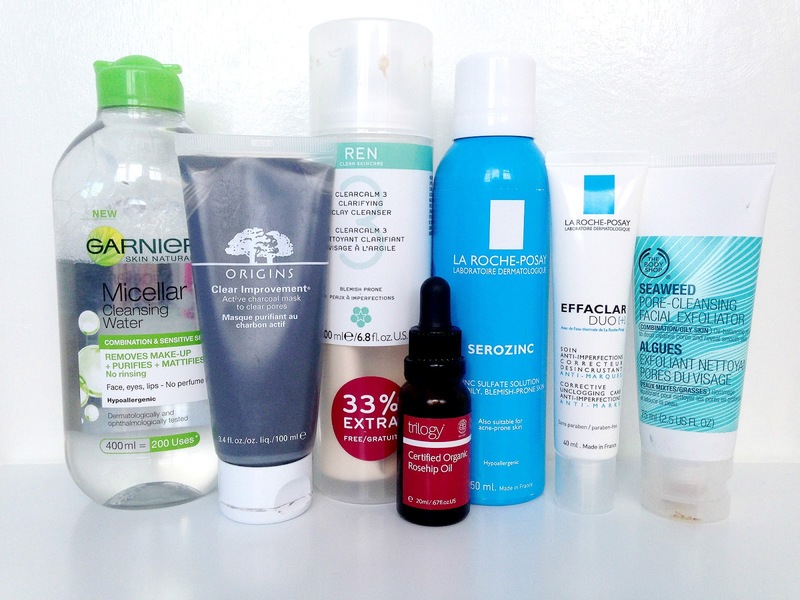 I've also recently started using La Roche Posay Serozinc to try and tone and calm down my facial redness. 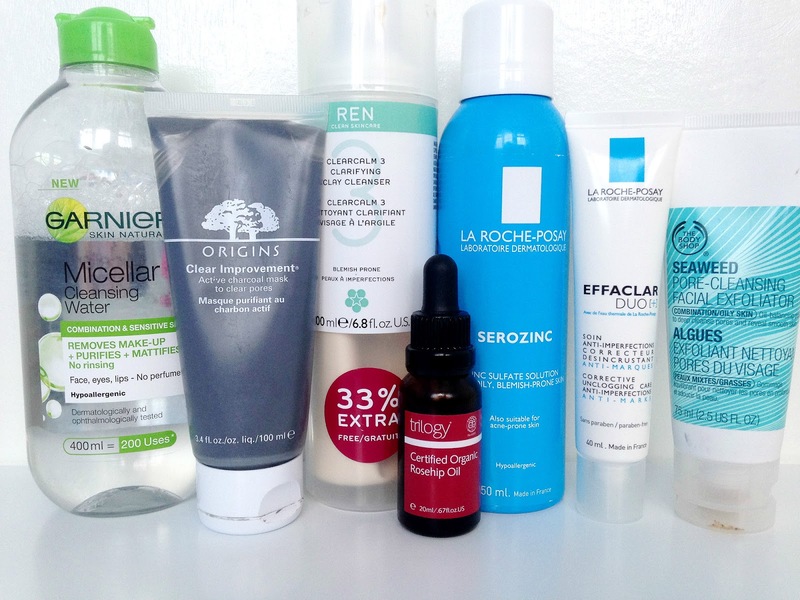 And a huge essential in my pamper night skincare routine is a spot treatment to help combat my acne. I swear by the La Roche Posay Effaclar Duo Plus(full review here) I've been using it for the best part of two years and it's never let me or my skin down. Also new into my skincare drawer is the Trilogy Rosehip Oil which I'm hoping will help with the scarring that my acne has left. I must apologise for the very in depth detail of the products involved. If you'd like to see a review on any of the above products featured please let me know. What is your skincare regime on a pamper night? We are officially halfway through the year and we're now in June. How crazy is that?! As I hadn't done a monthly beauty favourites since January(see my January favourites here) I thought I would show you what I have been loving in May. Everything is completely new to my favourites and I have been getting so much use out of them all. It's a mixture of just skincare and makeup, but mainly makeup. There is no bodycare whatsoever. I didn't actually expect to have more makeup favourites than skincare as I've been really into looking after my skin lately. I have completely fallen head over heels for the Origins GinZing Moisturizer. Not only does it smell heavenly(almost zesty and like oranges) but it's really lightweight and soaks into my skin soo quickly. 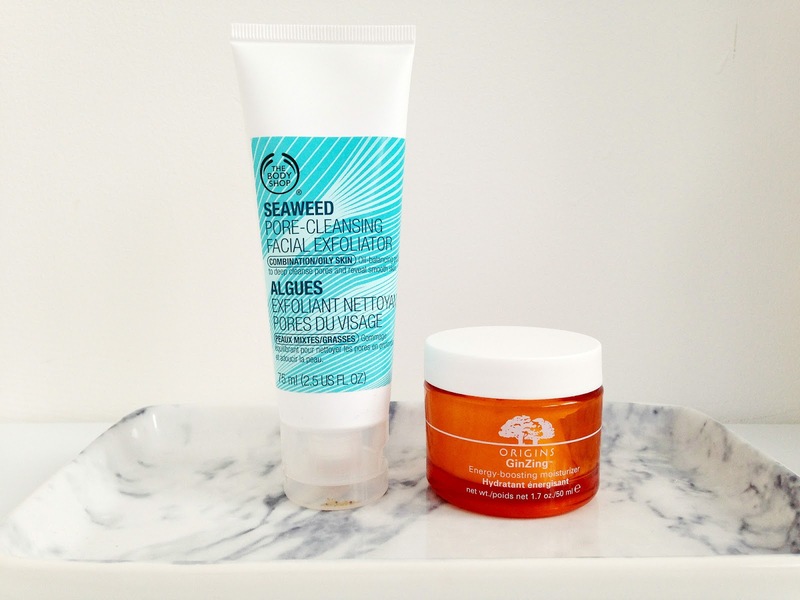 I also have been loving The Body Shop Seaweed Pore-Cleansing Facial Exfoliator. It's soo gentle on the skin and makes my face feel so smooth and refreshed after use. Onto the makeup. 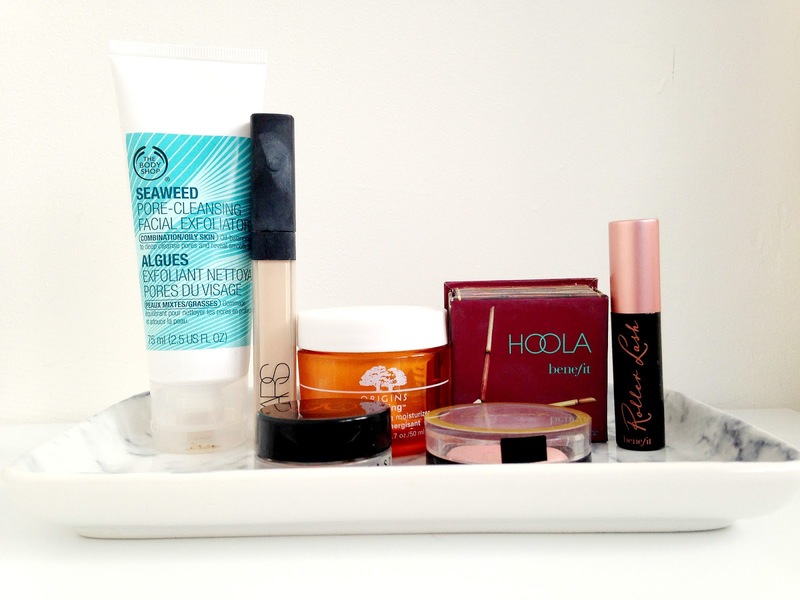 I have been enjoying the Benefit Hoola Bronzer so much. It completely changes my complexion. I use it as a light contour and it really brings out my cheekbones and makes my face look less 'ghostlike' and pale. I have no idea why I've only just started using it after it being left in my mini drawers for a while. Another Benefit product I have been using a lot of in May is the Roller Lash Mascara(I have a review here). It's incredible and probably the best mascara I have come across in a while. Need I say more? I have been besotted with the NARS Radiant Creamy Concealer in Chantilly since discovering it in the back of my muji drawers a month or two ago. It conceals my redness, acne and scars so well, as well as making me look more awake in the early mornings which is just what I need. The Anastasia Beverly Hills Dipbrow Pomade in Medium Brown was love at first use. It really defines my brows but makes them look natural at the same time which is something I love. I also find it pretty easy to work with too. I absolutely love it. Lastly is the Max Factor Creme Puff Blush in the shade Lovely Pink. 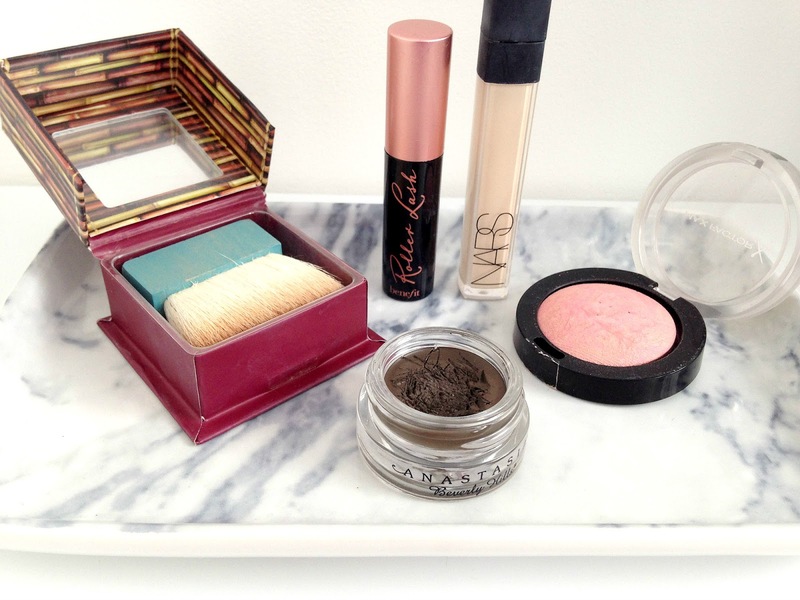 I adore the creme puff blushes(review here). I have three but I specifically love this shade. It's so natural and doesn't wash my skin out at all. What were your beauty favourites in May? I've always talked about getting a little personal here on the blog and incorporate a bit of my life into it to help you to get to know me a bit better but that's just never happened. 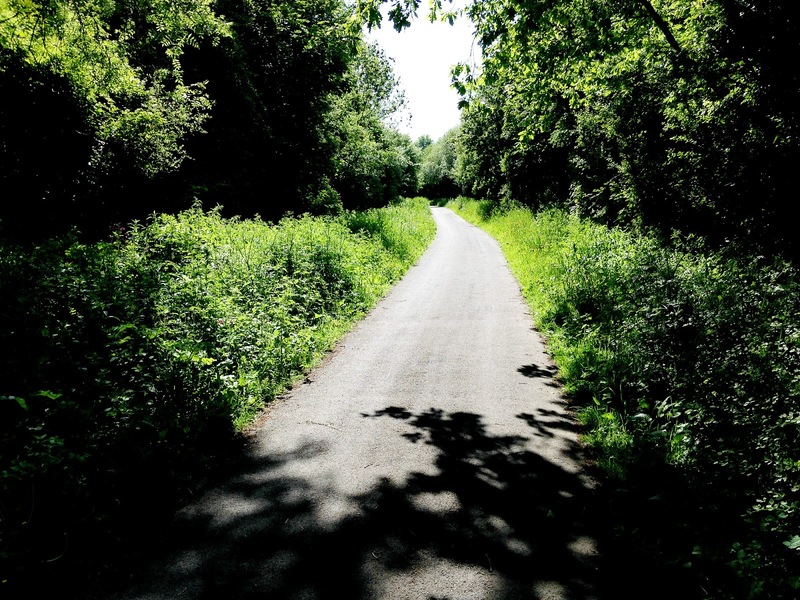 Just last Saturday I had a fantastic family afternoon walk on the Tarka Trail in my hometown which was so enjoyable and so I thought I would share that day with you. 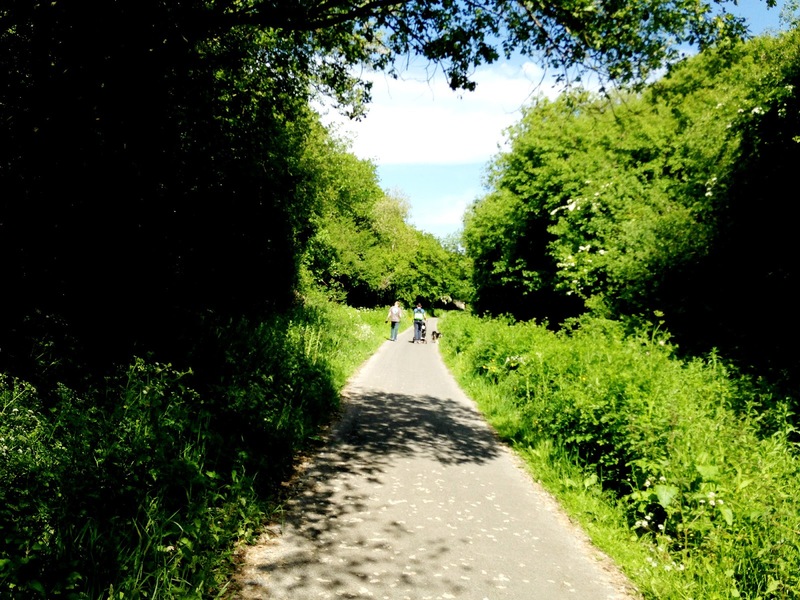 The Tarka Trail is pretty much a long footpath throughout North Devon for cyclists and those that enjoy a long walk in general or to travel to the nearby beach. 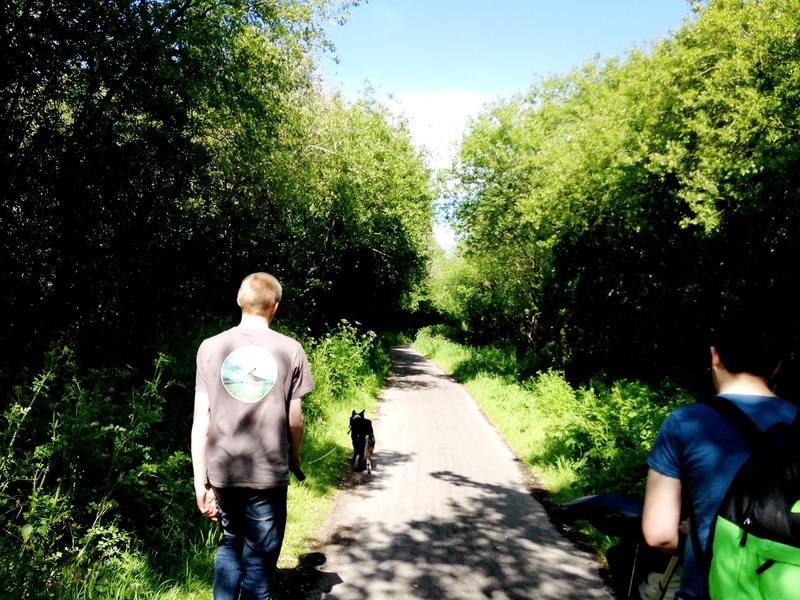 Me, Josh, my younger sister and brother decided to take a walk along with their dog Molly. 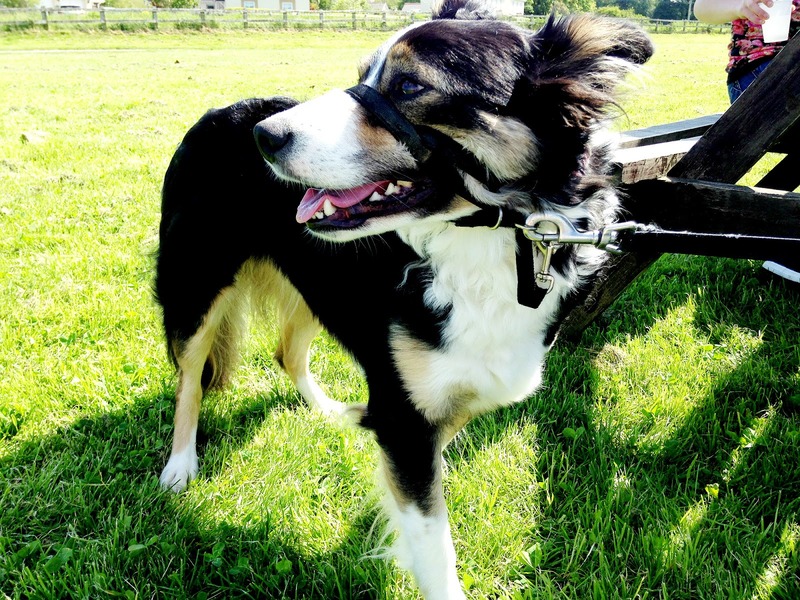 It was nice to take her for a walk as it was great weather on the day and great exercise for her as well as me(great for helping me lose the 'mum tum', haha). I felt so silly though. I was wearing skinny jeans and a jumper. It was so hot, I just felt like stripping but that was clearly not an option, haha. I should've at least took some spare clothes with me. That's something I'll have to bare in mind next time. 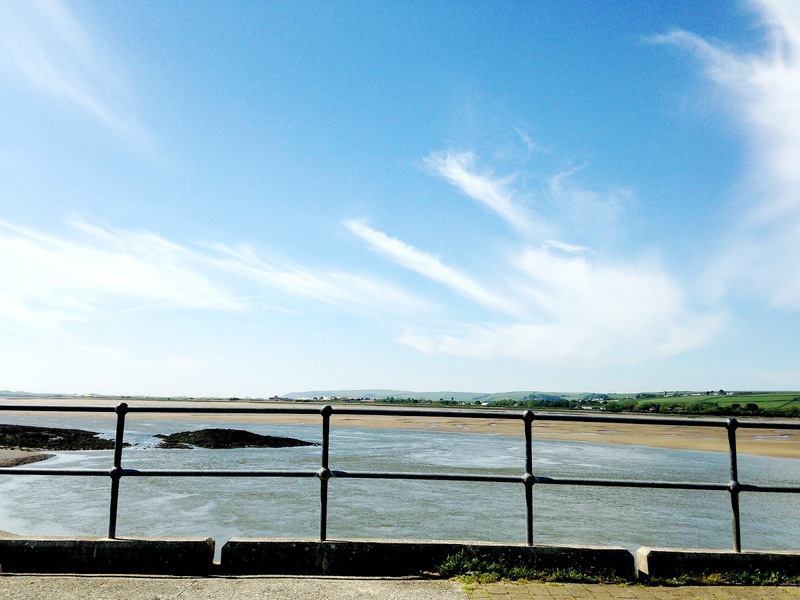 The Tarka Trail is quite long and so we decided to just walk a few miles and we stopped off at a quay which had a small cafe, a park, picnic benches and not to mention, some pretty great views. It was so nice to get away from the town. It was so peaceful. We packed some food up beforehand and we made a little picnic for us all. 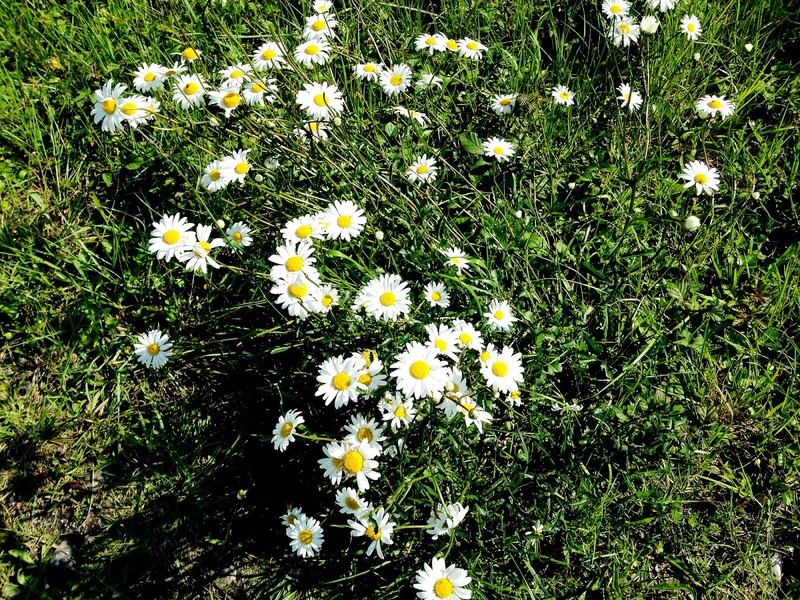 It was so sunny, I had to take in the lovely views and I couldn't help taking a few snaps. It was such a long walk there and a long walk back so it was nice to just relax and have something to eat and drink inbetween. I was completely knackered when I got home. Overall, it was a fantastic day with a lot of laughs, jokes, incredible weather and I ended up with a sunburnt back! Unlucky for me. That'll teach me for not plying my skin with the sun cream, oops. 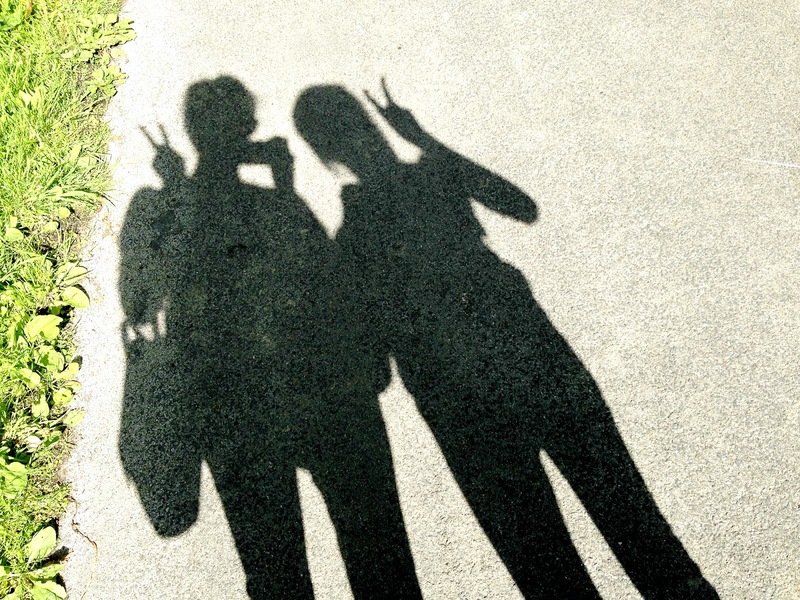 I am really looking forward to this summer. Alfie is growing up so quick so we will be able to do so much more with him. Hopefully this summer it will be more sun than rain but you never know with the british weather can you eh? Oh, and I must apologise for the photo heavy post. I got a little carried away. How will you be spending your Summer? I am the kinda girl who normally sticks with the whole wash, blowdry and straighten hair routine but recently I've been wanting to go out of my comfort zone and try out different hairstyles. My hair is quite thin and damaged due to endless hair dyes and bleach and it sometimes becomes a little frizzy and untamed with hair all over the place which obviously isn't very attractive. I am always on the look out for products to tame my hair a little and so I was very pleased when I was contacted to try out the Black and White Hair Dressing Pomade. I occasionally like to put my hair up in a donut bun with all of my hair slicked back. Having a fringe is quite difficult and no amount of hairspray will pull it back without it giving my hair that icky crispy texture. Not appealing in the slightest. 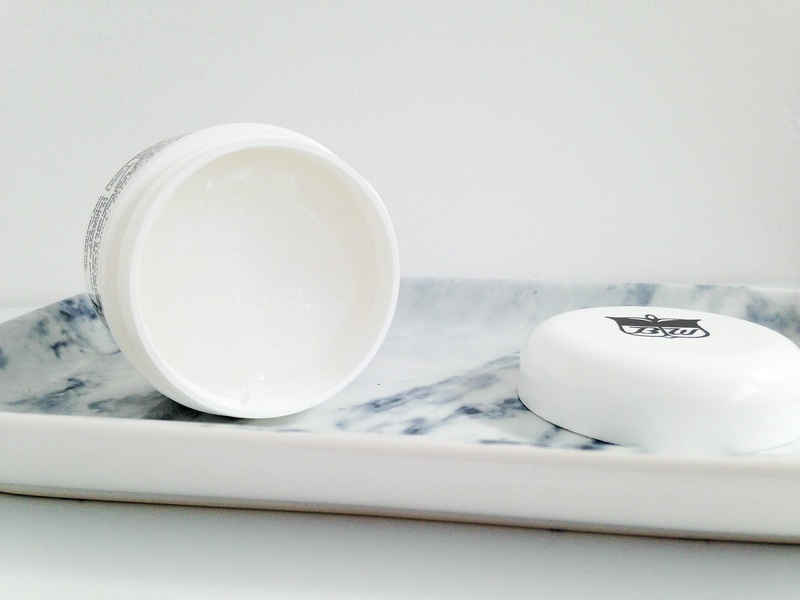 The packaging of the Black and White Hair Dressing Pomade is very basic but I quite like it. The monochrome theme is really appealing and it is a great size with 50ml of pomade inside. That is pretty good as it will definitely last a long time. I didn't know what to think of the pomade at first as it's not like something I have ever used before. It has a rather 'waxy' texture to it but it's transparent which is ideal. I had to use a few scrapes of the pomade to pull my fringe back. The pomade is extremely easy to work with though and pulls away all those horrible flyaway hairs. I always have a few pieces of hair at the side of my face that always stands out, and not in a good way. Thankfully upon applying the pomade it was no longer a problem. I do have one slight negative to say about it though and a little warning. Never use on 3-4 day old hair. You know, when your hair starts getting a little greasy. It's really not the best thing to apply at that point as it leaves the hair looking even greasier and not brilliant to look at, haha. I learnt my lesson. It also unfortunately takes a while to wash out, but I'm guessing it depends on how much is applied. It took me two washes to get it all out of my hair. The Black and White Genuine Pluko Hair Dressing Pomade currently retails at just £4.65 in Boots which is a pretty great price. I'd say it's a bargain. 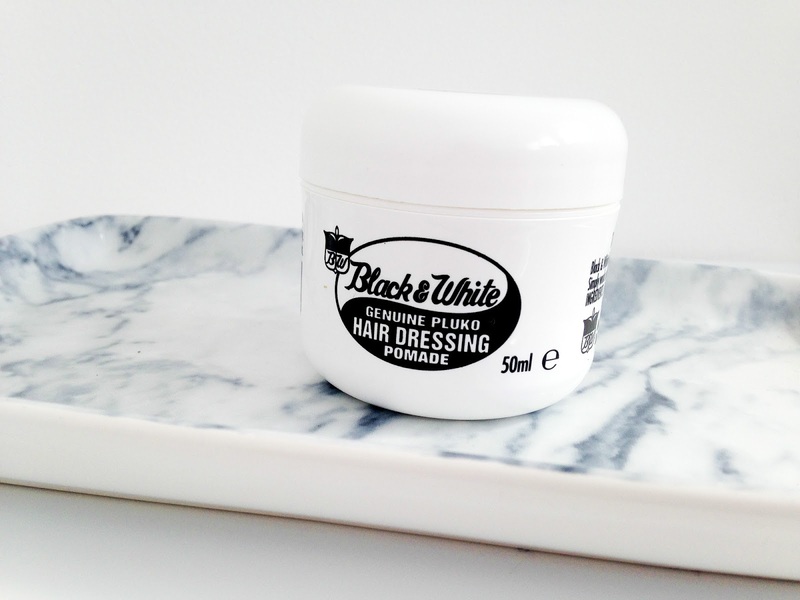 Have you tried the Black and White Genuine Pluo Hair Dressing Pomade?